The bountiful southern provinces are always known for their elegant dishes which combine the interesting local specialities with simple yet demanding cuisines. One obvious example of this statement must be the Grilled Mullet Fish Wrapped in Lotus Leaves in Dong Thap. Even though it has just been invented recently, this delicious dish has attracted many visitors from other parts of country to Dong Thap. 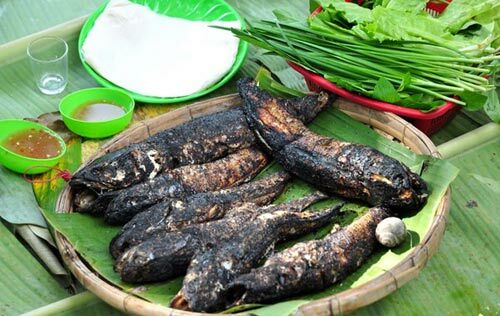 The grilled mullet fishes are grilled, wrapped in lotus leaves and dipped in tamarind sauce. The mullet fishes used in this recipe can be caught in many ponds or springs throughout the province. Each of the fish only weighs about 5 kg. Unlike that of mullet fishes raised in the city, the body of natural mullet fishes is firm and slim. Therefore, the meat of those fishes is very chewy, sweet, and bones-free! Right after they are caught, the fishes are washed and grilled on red coal. We have to pay great attention when grilling, otherwise the fishes will be burnt. A well-grilled fish has a tempting yellow color; its skin still remains, covering the fragrant and white meat inside. After separating the grilled fish into two halves and putting them on the dish, we dust crumple nuts and pour the special sauce on top. Made solely from oil and onion, this sauce will enhance the smell of the dish. The grilled mullet fishes are served with lotus leaves and tamarind sauce. The procedure to eat this dish is somehow similar to that of summer rolls. However, instead of using rice paper, you use lotus leaves to wrap around the fish and fresh herbs. Last, never and never forget to dip the fish in tamarind sauce. This wonderful tropical sauce will make eating this dish an unforgettable experience for you!